Fragment c) 2 columns. Written Area: recto 42mm x 117mm, verso 42mm x 118mm. Column Width: 53mm, except col. 2 of verso 55mm. Number of Lines: 11. Line Height: 4mm. Pencil mark "c)" on Fragment c). Rubrication. Littera Gothica Textualis. Content: Theology. The recto is partly about Jesus & disciples, cites Augustine, & notes that metrica is a word from Greek. The verso discusses wine (it gladdens, and is wisdom is called wine) and Eve. Fragment d) Notes to main text (which is missing) only. Written Area: recto 35mm x 27mm, verso 4mm x 27mm. Number of Lines: recto 1+5, verso 1. Line Height: 3mm. Littera Gothica Glossularis. Fragment e) 1st fragment Notes to main text (which is missing) only. Written Area: recto 58mm x 22mm, verso 32mm x 20mm. Number of Lines: recto 1+3+2, verso 2+1+1. Line Height: 3mm. Littera Gothica Glossularis. 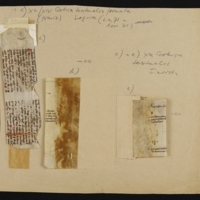 2nd fragment Notes plus some main text (on verso only). Written Area: recto 59mm x 28mm, verso 50mm x 43mm. Number of Lines: recto 1+6 are visible, some seem to have rubbed away, verso 14 main text plus 1 for note. Line Height: 4mm (main text), 3mm (notes). Littera Golthica Textualis (main text) & Littera Gothica Glossularis (notes). Content (fragments d-e) Canon Law, about baptism. Text (frag. e) with minute notes. The notes indicate that the text dealt with baptism, at least partly. A variety of signes-de-renvoi was used to key the notes to the text. 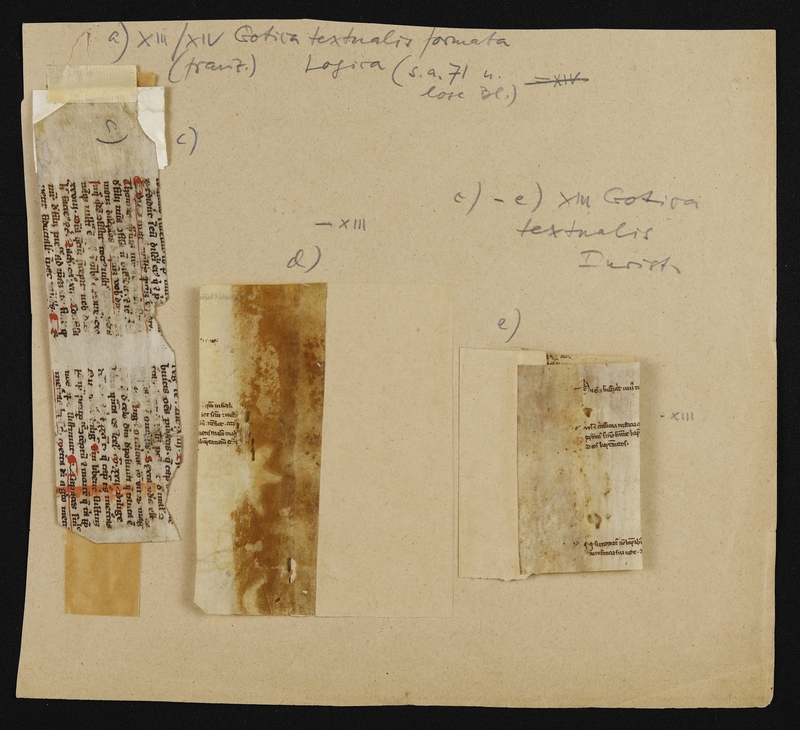 Physical Size: 4 parchment fragments (c. 40 x 149mm, d. 109 x 41mm, e. 68 x 40mm, 70 x 49mm. c) has been inserted into a white piece of paper (44 x 55mm) and then glued to a very thin piece of brown paper (30 x 131mm). d) is glued to a small piece of brown paper (110 x 54mm). 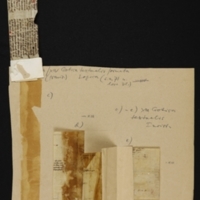 The two fragments comprising e) are glued to another small piece of brown paper (76 x 50mm), which is folded.The 2nd fragment of e) is currently upsidedown. 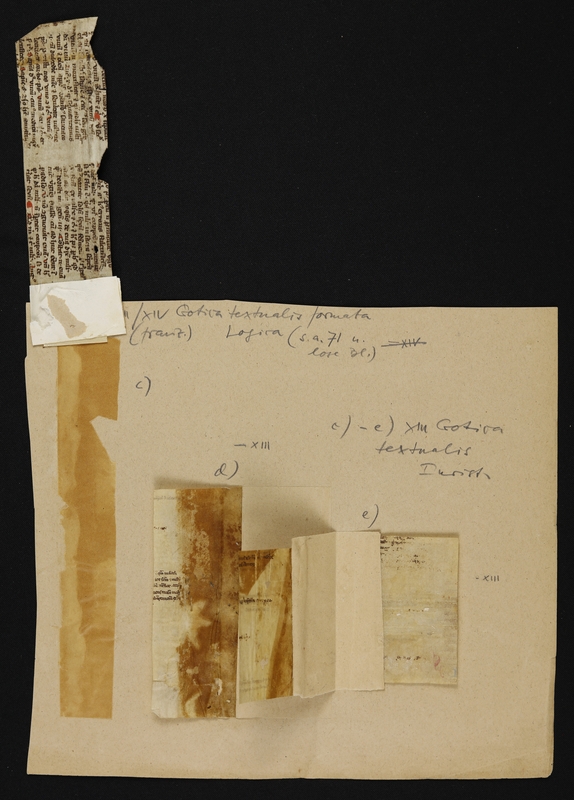 All fragments are then glued to a larger sheet of brown paper (224 x 251mm).